The Patriots kick off the 2014 season against the Miami Dolphins at Sun Life Stadium. Follow along here for live updates of the game, including commentary and analysis from Boston.com's Zuri Berry. 2:44 4th quarter: Dolphins 33, Patriots 20 — Miami's Caleb Sturgis kicked a 27-yard field goal, his third of the game as the Dolphins continued to pull away. 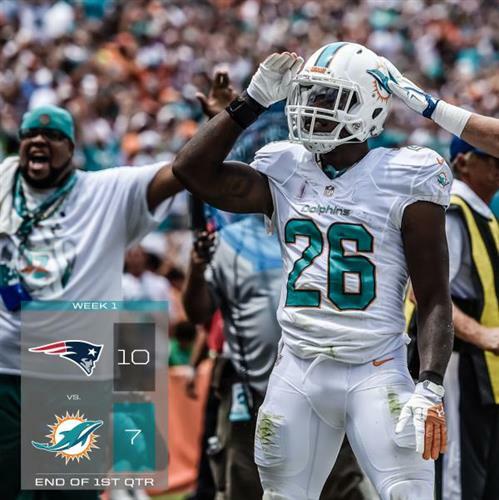 3:29 4th quarter: Dolphins 30, Patriots 20 — Knowshon Moreno pounded in a 4-yard touchdown run as the Dolphins took a commanding lead. 2:38 3rd quarter: Dolphins 23, Patriots 20 — Miami's Caleb Sturgis kicked a 22-yard field goal as the Dolphins re-took the lead. 6:55 3rd quarter: Patriots 20, Dolphins 20 — Mike Wallace caught a 14-yard touchdown pass in front of Darrelle Revis as the Dolphins tied the game. 10:46 3rd quarter: Patriots 20, Dolphins 13 — Miami's Caleb Sturgis nailed a 24-yard field goal after the Dolphins drove 66 yards on eight plays. 0:06 2nd quarter: Patriots 20, Dolphins 10 — Stephen Gostkowski kicked a 45-yard field goal as the Patriots closed out the second quarter. 1:59 2nd quarter: Patriots 17, Dolphins 10 — Darrelle Revis broke up a possible touchdown throw to Mike Wallace and was the beneficiary of bad Ryan Tannehill throw on another attempt in the end zone as the Patriots held the Dolphins to a second quarter field goal by Caleb Sturgis from 38 yards out. It was an 11-play, 55-yard drive by the Dolphins. 8:37 2nd quarter: Patriots 17, Dolphins 7 — Rob Gronkowski is officially back. The Patriots tight end caught a 6-yard touchdown pass from Brady as the Patriots took a 10-point lead over the Dolphins. The scoring play capped an 11-play, 94-yard drive that spanned 4:19. 0:47 1st quarter: Patriots 10, Dolphins 7 — Stephen Gostkowski converted a 47-yard field goal as the Patriots took the lead with less than a minute remaining in the first quarter. 5:10 1st quarter: Patriots 7, Dolphins 7 — The Patriots came back with a quick, methodical drive, led by Tom Brady. Brady was 6 of 6 passing on the drive for 46 yards. Shane Vereen had a pair of 2-yard runs, including a touchdown plunge to tie up the ball game. The Patriots went 13 plays for 80 yards in 6:36. 11:46 1st quarter: Dolphins 7, Patriots 0— After a blocked punt on the Patriots first offensive drive, the Dolphins drove 15 yards to the Pats end zone. Ryan Tannehill connected with Lamar Miller for a 4-yard touchdown. Looks like Brady tried to force it in there to Gronk. Ryan Wendell flagged for a personal foul face mask. Brady with a screen pass to Edelman on third down. Looks like a long field goal for Gostkowski. Stephen Gostkowski is good from 47 yards out. Patriots 10, Dolphins 7. Gostkowski's field goal is good. #Patriots take a 10-7 lead on a 47-yard field goal. No problem on the snap by Danny Aiken that time. Wendell and Connolly both with miscues on that drive. Makes the debate over OL early in the preseason look precient. Line looks pretty shaky so far, but G picking up where he left off last year! Sealver Siliga, in his first play, makes a play on the screen pass to Lamar Miller. Siliga lined up at the nose tackle. Also, Dominique Easley in at 3-4 DE. Mike Wallace with the nice catch, looks like with Revis in coverage. Early takeaway: Looks like Patriots are still tinkering with the offensive line. Darrelle Revis got beat on the 22-yard catch by Mike Wallace on a crossing pattern. I'd add that Easley's insertion looks more like a trial run after missing the preseason. Like, what can the kid do? For those asking about the pass rush, the Patriots were definitely using a contain on a few plays there. Cushion off the line. RT @KBevans87 : @ErikFrenz pick? Speed? We're in the second quarter. Also interesting to see Tavon Wilson cycle in. The Patriots are definitely tinkering with their safeties too. Tommy Kelly would have helped there. Interception by Alfonzo Dennard. Really terrible pass by Ryan Tannehill. Should've been an easy touchdown after Dennard was beat. Patriots take over at their own 6. Hightower just smoked Tannehill while he was stepping into that throw. Dennard turned around to find an underthrown ball and easy INT. Kelly's washed up. Tannehill still in 2013 form! Two early TOs by Patriots D - promising for the "new look D", even though the second was really Tannehill's fault. Ryan Wendell back in at center. Doesn't look like a rotation is in place. Connolly still at RG. Cannon still at LG. Devey odd man out. Cameron Wake brings the pressure right into Brady's face. No fault on oline there. Nifty run by Shane Vereen. Gets a first down for the Patriots. Shane Vereen with the nice move to elude Olivier Vernon in space. Kenbrell Thompkins with a good block to set the perimeter. Great run! Whats with the bad footing there, tho? There was a football game last night, some soccer, and another event at Sun Life in the past two days. Something to pay attention to. That was an impressive catch but we saw those catches all the time during training camp. All. The. Time. Nice pitch and catch from Brady to Edelman for 44 yards. Edelman fights through the contact to bring it in. That was an impressive catch bvy Julian Edelman, but we saw those catches all the time during training camp. All. The. Time. Is it natural grass there?